Our Men's Bible Study group meets every Thursday at 7:00 P.M. As a means of discipleship, the men study the Word of God together and use this time to grow and share in life together. At times we do projects throughout our community for those in need by using chain saws and hand tools to do light repairs. We also celebrate in each others achievements as a support group. Another ministry of our Men's Group focuses on, is our young men; those who have no father or disengaged fathers, by offering them education in manly skills through our "Essential Manhood". This effort allows us to teach our young men how to perform basic skills - like automotive, electrical, plumbing, and survival tips - that they will use on a regular basis. 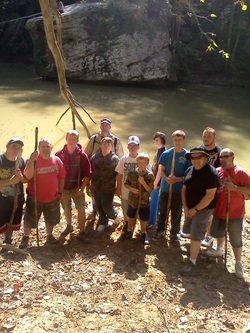 In addition, we annually take a weekend trip to the woods or fishing with those that participate in Essential Manhood.